Easily manage all your applications! The pipeline manager connects your borrower data directly to industry resources like credit reports, investor rates, real time pricing and locking all at the push of a button. Use it for your "Next Step" of the pre-qualification process. Both the 1003 and the Express application can download to the majority of loan processing software such as Calyx Point, Encompass, Byte or Pipeline Solutions. Saving you countless hours of having to re-input this data manually. Downloading an application into your loan processing software is a snap! We have made it so easy that it can be done in a matter of seconds! Can I view Started but NOT Submitted Applications? YES! 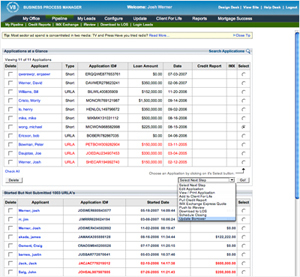 The Virtual Lender® Pipeline Manager provides you full access to applications that a person may have started but for whatever reason did not finish. This is a great resource for leads! In addition to 'Started but not Submitted Applications' the Pipeline Manager will also provide you a list of the application login attempts as a lead (Login Lead). In most cases this will include the borrowers first and last name as well as phone number.